So much of this episode feels at first like a series of cleverly set traps. But those traps never quite spring. How does an episode called “The Cubicle,” which opens with a toast to Cece’s new business and her temporary in-loft office, never once show Cece in her cubicle? Looking at the New Girl universe from the outside, there are two obvious answers to that question, one resonant and one reductive. Let’s start with the bad and move on to the good. Cece says that her cubicle, set up at one end of the loft’s big dining table, represents “a real make-or-break moment for me.” She predicts that she’ll either recall it as “my Steve Jobs in the garage phase” or as just another failure haunting her. 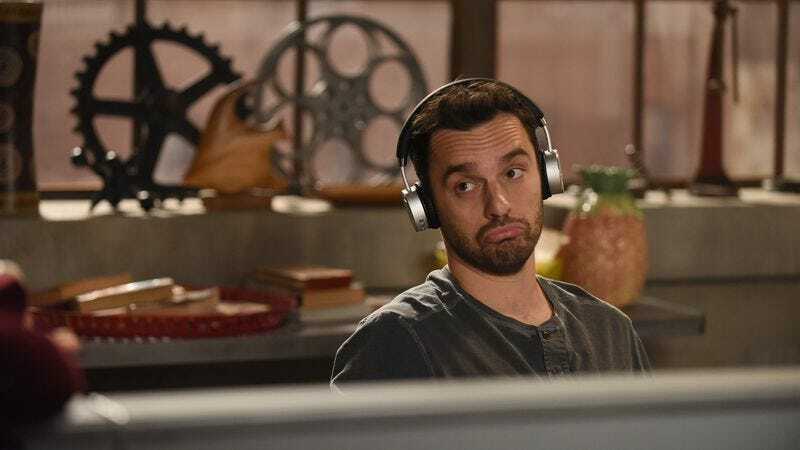 Cece’s lack of agency has become a running theme in my New Girl reviews because it’s a pervasive, even self-conscious element of this season. Lately, her life has been laid out at every step by the people around her. In “Ready,” Nick decided her new career; at the end of “The Cubicle,” Schmidt has designed her permanent workspace in secret. “You have done so much for me,” Cece tells her husband mid-episode, “more than any normal person.” He really, really has. Schmidt even unilaterally decides the name of her business. As Cece stumbles over her words fielding questions from an interested photographer, Schmidt blurts out, “Cece’s Boys! Where the men are boys and the boys are Cece’s!” Talk about a lack of agency: Another character literally names her agency for her. The title of “The Cubicle” isn’t really about Cece’s temporary office space, or even about Cece. It’s about Nick and Jess. They’re the ones who make the most use of the cubicle, that flimsy half-wall that’s a mere gesture of seclusion. After Jess kicks out Robby (for refusing to sue her for $200,000.00 in medical bills) and Nick leaves Reagan snoring over the first few pages of The Pepperwood Chronicles, they retreat to Cece’s new workspace. There, they sit together in a pretense of privacy, commiserating about their relationship woes and drinking as night falls around them. When Jess asks what’s wrong with her, Nick looks wary. “This feels like a trap.” And it does, in the best way. Walling them off, even symbolically, from the rest of the ensemble and the rest of the world emphasizes the chemistry between these two characters and these two actors. I’m amazed they got through the episode without a kiss or a near miss. The episode’s opening seems to set up the action of “The Cubicle” with admirable clarity, from Cece’s cubicle to Reagan’s ignorance of Nick’s novel to Robby’s search for a stamp. But that clarity quickly gets muddied. To put it in Nick’s terms as he stares idly at Cece’s clichéd Newton’s cradle desk toy: This episode is lacking momentum. Instead, it’s carried along by familiar New Girl patter, beloved characters, and deft, fluid staging from returning director Jay Chandrasekhar. But Robby’s inability to see any fault in Jess is a real problem, not an imaginary problem. Instead of facing it, Kim Rosenstock’s script jumps past it, leaving Robby and Jess to reconcile without any true resolution. Each of them pledging not to “do my thing” isn’t the same as unpacking what the thing is and how to avoid it in the future. By contrast, Nick and Reagan—characters who constantly struggle with their prickly self-protective natures—once again end an episode hashing out their differences with the textbook honesty of a successful couples counseling session. “So, you’re excited to read my book, but you just might fall asleep when you read it, but it’s not personal?” Nick echoes back to Reagan after she lays out her fears and hopes. The earnest, productive back-and-forth they’re developing is weirdly sweet—all the more so for being tremendously rare in the sitcom world. Compare that frank acceptance with Jess and Nick’s tipsy commiseration in the cubicle. “Relationships are hard,” Jess says, about to go confront her easygoing, admiring boyfriend. “They sure are,” says Nick, whose girlfriend has uprooted her life for him. “But we can’t stay here forever, can we?” After a long, loaded pause, they agree: They can’t. No, they can’t. Despite its lack of momentum, “The Cubicle” packs some power. It’s no quick-snap trap to spring on the unwary. Instead, it hints at a slow snare, a time-release temptation that starts by reminding Jessica Day and Nick Miller, even as they’re working to sustain their current happy relationships, what it’s like to be alone together. Winston, who provides the bull box, is also the C.O.W. : Cop Of The Week. Another of Robby’s theme restaurant favorites: Hash It Over, a hash-brown joint down at the mall.